It was just days before the Passover, and the enemies of Jesus were busily plotting their treachery to bring about His death. Their concern was timing. Not during the approaching feast, they agreed, as it would cause an uproar among the people. 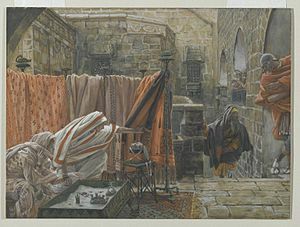 Jesus, knowing full well that His days were numbered, was in Bethany sharing a meal with His disciples in the home of Simon the leper. A woman approached him at the table, an alabaster flask in her hand. She broke open the thin neck of the vial and poured out its contents, a very expensive fragrant oil, anointing his head. Her actions were met with harsh rebuke from the disciples. What a waste, they cried! Among some there was a tradition to give gifts to the poor on the eve of Passover. The sale of this ointment, possibly made from the rare nard plant from India, would have amounted to an impressive donation. Christ chided them for their angry indignation. It was obvious His disciples had missed the real import of this simple gesture. Mark does not say who this woman was, but the account in the book of John shows that she was Mary, the sister of Martha and Lazarus. Jesus praised her deed as worthy for a memorial for generations to come. What were the real lessons here? What did the disciples fail to see? Perhaps filling in some details will bring further understanding to this account. It was a custom of the day to pour a few drops of perfume on a guest when he arrived or when he sat down at a meal, according to William Barclay’s commentary on the book of Mark. This woman was showing Jesus great honor, not with a few drops of ordinary perfume, but with the entire contents of a flask of precious ointment. The vial had been broken and nothing could be saved back. In this sense she gave her all unconditionally. When a criminal was crucified, his body was tossed on a refuse pile for wild animals to devour. There would be no honor paid to the deceased—no professional mourners and no burial ministrations. Since Jesus was unjustly branded a criminal, it looked like His would be an ignominious end. Barclay comments: “It was a custom in the East, first to bathe, then to anoint the bodies of the dead. After the body had been anointed, the flask in which the perfume had been contained was broken, and the fragments were laid with the dead body in the tomb.” This woman was foreshadowing events to come, namely His death and resurrection. He Himself affirmed, “For in pouring this fragrant oil on My body, she did it for My burial” (Matthew 26:12). When the disciples witnessed her act of adoration, their response was surprising. Instead of being touched or even humbled by her actions, they were angry! Ironically, they themselves failed to fully recognize the Man who sat before them and the sacrifice He was about to make. Did the woman herself comprehend the implications of her actions? Were Jesus’ words puzzling even to her? No one knows for sure, but in Jesus’ eyes, that deed was worthy to be preserved forever in the pages of the Bible. Within days, the nefarious plot was brought to completion. Jesus conducted His last Passover and was betrayed by a chosen disciple, convicted by false testimony, scourged, crucified and buried in a tomb (by the intervention of Joseph of Arimathea, to fulfill prophecy). When a few of His women disciples finally arrived with spices to anoint His dead body, He had already risen! But they needn’t have worried—a woman had already taken care of the anointing. And, as a result, in Jesus’ own words, “Assuredly, I say to you, wherever this gospel is preached in the whole world, what this woman has done will also be told as a memorial to her” (Matthew 26:13).